Jay Cooke (August 10, 1821 – February 16, 1905) was an American financier who helped finance the Union war effort during the American Civil War and the postwar development of railroads in the northwestern United States. He is generally acknowledged as the first major investment banker in the United States and creator of the first wire house firm. 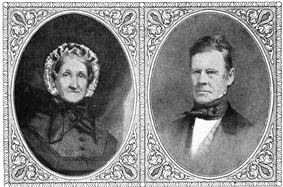 Cooke was born at Sandusky, Ohio, the son of Eleutheros Cooke and Martha Carswell Cooke. Eleutheros Cooke was a pioneer Ohio lawyer and Whig, a member of the Ohio General Assembly and member of Congress from Ohio in 1831-1833. In 1838, Cooke went to Philadelphia, where he entered the banking house of E. W. Clark & Co. as a clerk, and became a partner in 1842. He left this firm in 1858. On January 1, 1861, just months before the start of the American Civil War, Cooke opened the private banking house of Jay Cooke & Company in Philadelphia. Soon after the war began, the state of Pennsylvania borrowed $3,000,000 to fund its war efforts. 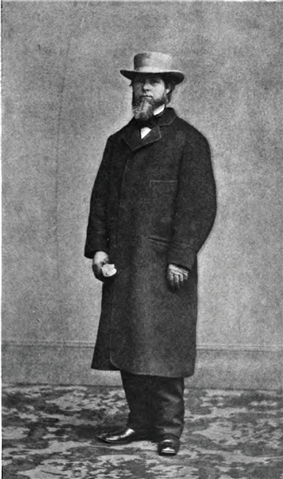 Cooke's own firm was so successful in distributing Treasury notes that Chase engaged him as special agent to sell the $500 million in "five-twenty" bonds — callable in five years and matured in 20 years — authorized by Congress on February 25, 1862. The Treasury had previously tried and failed to sell these bonds. Promised a sales commission of 0.5 percent of the revenue from the first $10 million, and 0.375 percent of subsequent bonds, Cooke financed a nationwide sales campaign, appointing about 2,500 sub-agents who traveled through every northern and western state and territory, as well as the Southern states as they came under control of the Union Army. Meanwhile, Cooke secured the support of most Northern newspapers, purchasing ads through advertising agencies, and often working directly with editors on lengthy articles about the virtues of buying government bonds. These efforts heralded a particular type of patriotism based on classical liberalist notions of self-interest. His editorials, articles, handbills, circulars, and signs most often appealed to Americans' desire to turn a profit, while simultaneously aiding the war effort. Cooke quickly sold the $500 million in bonds, and $11 million more. Congress immediately sanctioned the excess. Cooke influenced the establishment of Washington and another at Philadelphia almost as quickly as Congress could authorize the institutions. In the early months of 1865, the government faced pressing financial needs. After the national banks saw disappointing sales of "seven-thirty" notes, the government again turned to Cooke. He sent agents into remote villages and hamlets, and even into isolated mining camps in the west, and persuaded rural newspapers to praise the loan. Between February and July 1865, he disposed of three series of the notes, reaching a total of $830,000,000. This allowed the Union soldiers to be supplied and paid during the final months of the war. It was in this effort that he pioneered the use of price stabilization. This practice, whereby bankers stabilize the price of a new issue, is still in use by investment bankers in IPOs and other security issuances. Although Cooke's bond campaigns were widely praised as a patriotic contribution to the Union cause, his huge personal financial gains did not go unnoticed. Notorious for stalling the deposit of bond proceeds into federal coffers, he was accused of corruption, and on December 22, 1862, Representative Charles A. Train proposed a Congressional investigation of the Treasury—though the investigation was never realized. In the Republican nominating process of 1868, which eventually saw Ulysses S. Grant as the Republican party standard-bearer, Cooke backed Radical Republican Chief Justice Salmon P. Chase for President. After the war, Cooke became interested in the development of the northwest, and in 1870 his firm financed the construction of the Northern Pacific Railway. Cooke fell in love with Duluth, Minnesota, and decided he must make it successful, the new Chicago. To this end he began purchasing railways with the dream of reaching the Pacific to bring goods through Duluth into the Great Lakes shipping system and on to the markets of Europe. In advancing the money for the work, the firm overestimated its capital, and at the approach of the Panic of 1873 it was forced to suspend operations. Cooke himself was forced into bankruptcy. 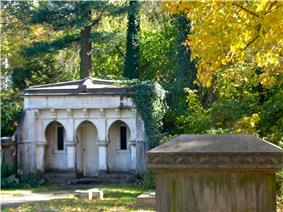 Jay Cooke's mausoleum in Elkins Park, behind St. Paul's Episcopal Church, which he founded. Jay Cooke was heavily involved in financial scandals with the Canadian Government and caused the Prime Minister Sir Donald Smith who then finished building the Canadian Pacific Railway. E. W. Clark & Co. The Jay Cooke papers, including correspondence documenting the work of Jay Cooke & Company, are available for research use at the Historical Society of Pennsylvania. Jay Cooke & Company Records at Baker Library Historical Collections, Harvard Business School. Larson, Henrieta (1936). 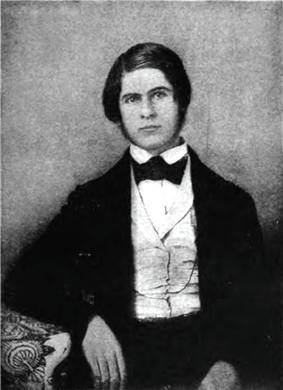 Jay Cooke, Private Banker. Cambridge, Massachusetts: Harvard University Press. M. John Lubetkin (2006). Jay Cooke's Gamble: The Northern Pacific Railroad, The Sioux, And the Panic of 1873. University of Oklahoma Press. ^ a b Lawson, Melinda. Patriot Fires: Forging a New American Nationalism in the Civil War North. Lawrence, KS: University Press of Kansas 2002. 40-64. Print. ^ Geisst, Charles R.. Wall Street: a history. New York: Oxford University Press, 1997. ^ "Citigroup - History". Citi.com. Retrieved on August 12, 2008. ^ "National Historic Landmarks & National Register of Historic Places in Pennsylvania" (Searchable database). CRGIS: Cultural Resources Geographic Information System. Note: This includes Frederick Platt (July 1980). "National Register of Historic Places Inventory Nomination Form: St. Paul's Episcopal Church" (PDF). Retrieved 2012-05-24. ^ "Google Maps". Retrieved 2011-12-26. ^ "The Historical Marker Database". Retrieved 2011-12-26. The village of Cooke City, Montana. Cooke Township in Cumberland County, Pennsylvania. Jay Cooke Elementary School in Philadelphia, Pennsylvania. Cooke Road in Cheltenham Township, Pennsylvania. Jay, Pitt, and Cooke Streets in the Lakeside neighborhood of Duluth, Minnesota. A statue of Jay Cooke by Henry Shrady is located in Jay Cooke Plaza near the intersection of 9th Avenue East and Superior Street in Duluth, Minnesota. A devout Episcopalian, Cooke regularly gave 10 percent (a tithe) of his income for religious and charitable purposes. He donated funds to the Philadelphia Divinity School and for the building of Episcopal churches, including St. Paul's Episcopal Church in Elkins Park, Pennsylvania. One of them is St. Paul's Episcopal Church on South Bass Island, across the bay from his summer home on Gibraltar. After he had been forced to give up his Ogontz estate in bankruptcy, he later repurchased it and converted it into a school for girls. Cooke owned a summer home, constructed in 1864-65 and still standing, on the small island of Gibraltar in the Lake Erie harbor of Put-in-Bay, Ohio. The island was a lookout for Commodore Perry during the Battle of Lake Erie in 1813. By 1880 Cooke had met all his financial obligations, and through an investment in a silver mine in Utah, had again become wealthy. He died in the Ogontz (now Elkins Park) section of Cheltenham Township, Pennsylvania, on February 16, 1905. Cooke's son and Barney's brother-in-law, Jay Cooke, Jr., joined the new firm as a minority partner.